Two of the facilities ten courts will be available for advanced reservations through New York City Parks and Recreation website, once all of the courts have been resurfaced, probably around May 1st. Reservations are $15 per hour. On-line reservations are available for the following day and up to one week in advance. 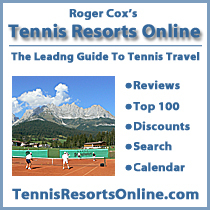 To make a reservation at the 96th Red Clay Courts go here to the NYC Parks Reservation site. Reservations are non-refundable. However, if your reserved hour is rained out, you will be able to make another reservation on-line to replace it. The purpose of the reservation system is to allow people unable to wait for a court access to the public courts, not to give extra time for those who have already played. Reservations are for first-time players only. Players using reserved courts are subject to the same repeat rules as other players. If any player on the reserved court has already played on the day of the reservation, the reservation will be forfeited. The other eight courts at the facility are not available for advance reservation or sign-up. They are available on a first-come/first-serve basis for the next available hour only. Sign-up is in-person. Note that both players must be available on the weekends to sign-up for the next available hour.